A positive-displacement compressor (i.e., piston, screw, etc.) uses the principle of compressing a fixed volume of gas. Almost all of the energy used by the device is directed toward the compression of gas into a smaller volume. This type of compression is very efficient and results in high pressures with the amount of energy used being directly proportional to the pressure achieved. The downside to positive-displacement compressors is that they are typically larger, heavier and more expensive to build than other types of compressors. 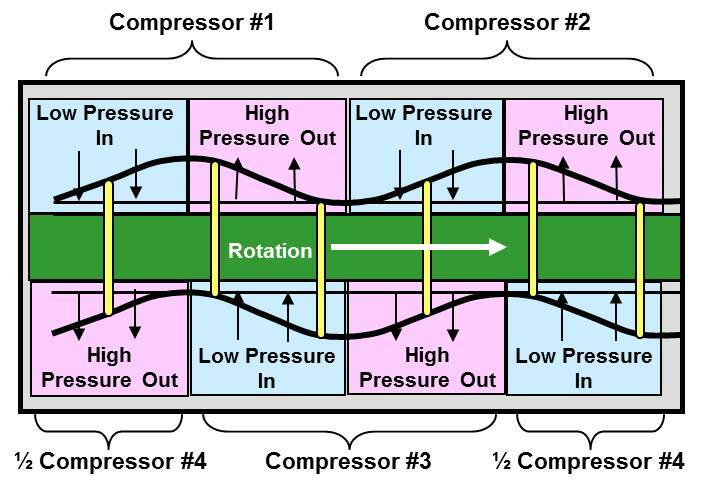 Centrifugal compressors use centrifugal force to transfer kinetic energy into the gas, which causes it to increase in pressure as it is “thrown” to the outside of the casing. The typically lower pressures achieved are limited by the amount of kinetic energy transferred to the gas. Not being a positive-displacement device, centrifugal compressors are less efficient. However, their simpler operation and construction makes them less expensive to manufacture and maintain. Conversely, a RadMax positive-displacement compressor acts as both a positive-displacement and a centrifugal compressor, incorporating the advantages of each. Because of its unique design, a RadMax compressor is able to utilize the volumetric energy of a positive-displacement compressor and the kinetic energy of a centrifugal compressor to pressurize a gas. This results in an exceptionally energy efficient device. Additionally, since the RadMax compressor’s operation and construction are more similar to a centrifugal compressor than a positive-displacement compressor, its cost to manufacture is closer to that of a centrifugal compressor. Together, this makes a RadMax compressor a highly efficient and cost effective solution for many compressor applications. Like a piston compressor, a RadMax compressor is a positive displacement device. There are two parts to the cycle: 1) intake and 2) compression with discharge. The RadMax compressor design is a combination of four distinct sections: two complete intake and exhaust compression cycles on each cam in the standard two-cam configuration. This unique design allows for each of these sections to potentially be configured with different compression ratios. Different porting options into and between the sections allow for the capability of multi-stage compression in one device or for use in a combined-cycle device such as the RadMax turbine engine. In the RadMax positive-displacement compressor, the vanes move axially driven by the rotor face. The pressure in each chamber changes when the adjacent vanes extend or retract. During rotor revolution, the ends of the vanes follow a path that approximates a sinusoidal wave. This path is uniquely designed so that during each revolution of the rotor, the chambers’ volumes alternately expand and contract. The process is repeated in each of the compressor sections, in each chamber, and on each side of the rotor. The rotor spins continuously in one direction rather than violently changing directions as with pistons in a reciprocating device. Because the upper and lower faces of the rotor are 90-degrees out of phase, the RadMax compressor is always balanced and exhibits minimal vibration. 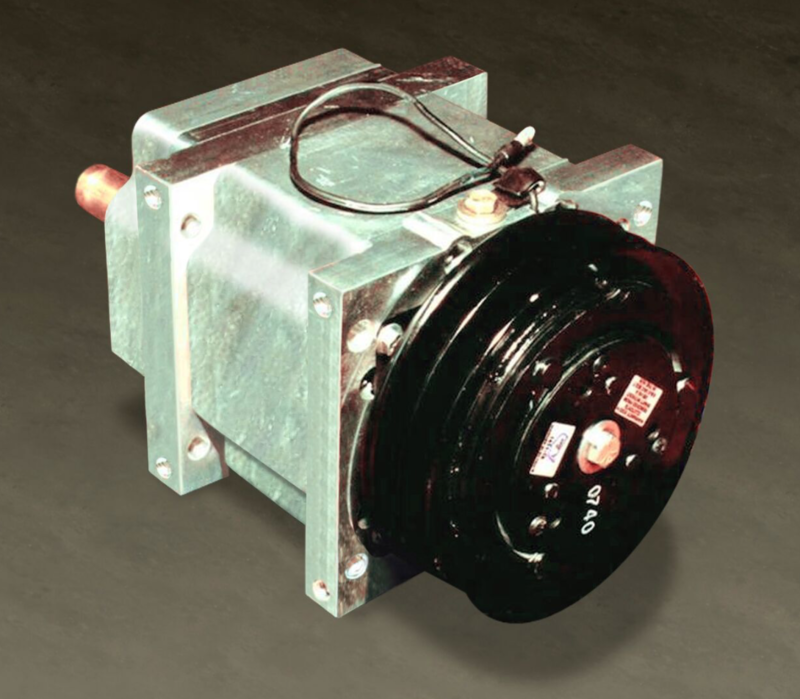 The RadMax positive-displacement compressor is well suited for compressing both high and low density refrigerants for industrial, commercial, residential and automotive air-conditioning systems; industrial gas compression; specialty compressors for the oil and gas industry; low density gas to high pressure; and RadMax turbine engine applications. Download a RadMax compressor brochure here.